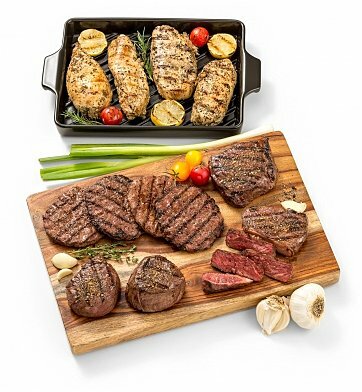 Completely trimmed and tender filet mignon, succulent sirloin steaks, marinated lemon herb chicken breasts and luscious steak burgers create a specially-curated selection of grilling delights that makes the perfect gift for friends, family, colleagues and even yourself. Two (2) Premium Angus Filet Mignon, 6 oz. each. Four (4) Lemon Herb Chicken Breasts, 6 oz. each. Two (2) Premium Angus Top Sirloins, 8 oz. each. Four (4) Angus Steak Burgers, 4 oz. each. Each item in this gift is securely wrapped in an insulated cooler gift box with enough dry ice to safeguard the shipping process and keep the steaks cold until arrival. A complimentary card with your personal message is included with your gift. For Maximum Freshness, Please Note: Meat is flash frozen before shipping to lock in flavor and will arrive frozen or partially thawed. Gourmet Grilling Gift is a hand delivered gift. These gifts are delivered by one of our local design centers located throughout the United States and Canada. Same day delivery is available for most gifts when ordered before the cutoff time. The cutoff time for Gourmet Grilling Gift is in the recipient's time zone. Chicago Steaks are individually wrapped and vacuum-sealed for freshness. Gift contains food-safe dry ice packs to safeguard the shipping process. Delivered in Chicago Steak Co.'s classic black and gold gift box.